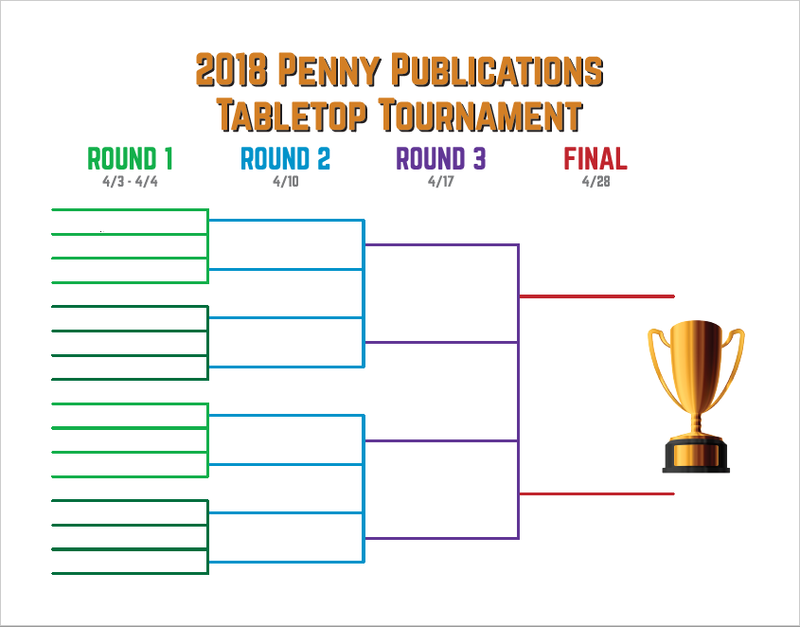 Over the last few weeks, we’ve been chronicling an epic sixteen-person game tournament held by our friends at Penny/Dell Puzzles. In Round 1, the field was culled from sixteen players to eight after well-contested battles of On the Dot and Bananagrams. In Round 2, it was halved again as this group of elite puzzlers went to war in games of Timeline and Qwirkle. In Round 3, two more contenders said goodbye as an intense game of Sheriff of Nottingham determined the finalists. 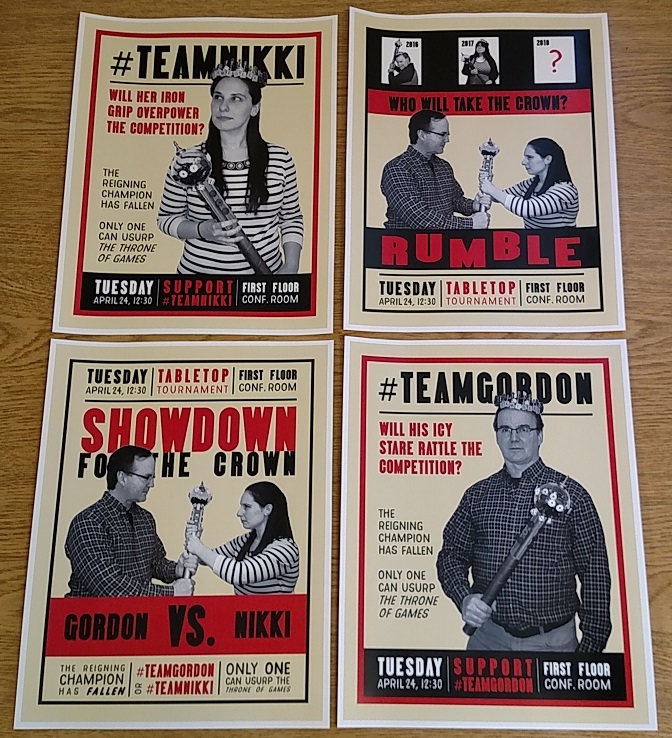 Only two competitors remained — #TeamNikki and #TeamGordon — and with only one more round standing between them and the title of PDP Tabletop Champion, spirits were high and anticipation reached a fever pitch. What awaited them in the finals? Let’s find out, shall we? Unlike the previous rounds, this was a head-to-head match-up, winner-take-all. So, naturally, we made posters to hype the event like a prizefight. The game for the finals? Linkee. 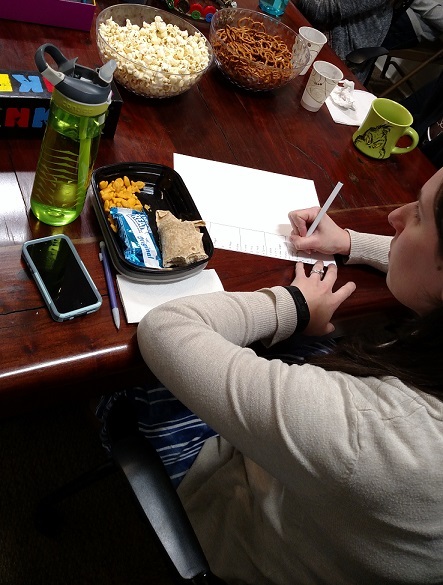 One person acts as the Question Master, while the other players each grab a pencil and pad. The Question Master reads each of the four questions on the card. 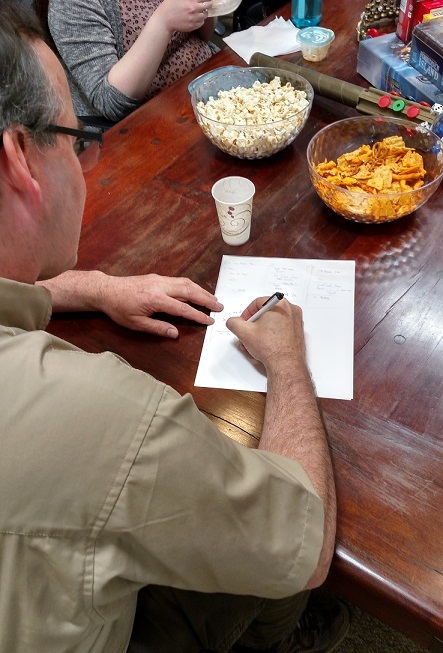 The players write down the answers and try to figure out what theme links the four answers. The first player to shout out “LINKEE!” and identify the link gets the letter card. You can shout out “LINKEE!” at any point, but if you’re wrong, you’re out until the next card is played. So confidence and boldness has to be tempered with strategy. That’s what makes the game more intriguing than your average trivia game. It’s not just knowing the answers to individual trivia questions; it’s figuring out the link between them, and doing so before your opponents. Gordon had an inauspicious start to the game, as he figured out the link between the first card’s questions, but neglected to yell out “LINKEE!” first, disqualifying himself from scoring the point. Nikki, seizing the advantage after scoring that first point, quickly followed up, cracking the links for the next four cards, leaping out to a commanding lead. It seemed like a shut-out was imminent and Nikki would be crowned the winner in commanding fashion. But no, Gordon would not go away quietly. As Nikki puzzled over the possible links for the game point, Gordon yelled out “LINKEE!” and scored his first point. It was now Nikki’s LINKE to Gordon’s L. This would not be the clean sweep many expected after the opening flurry of action. Gordon scored a second point (for the I), and then a third for the N. It was now LINKE to LIN. There was a change in the air, a buzz of excitement among the spectators, a frisson of uncertainty. It would appear we had a Comeback Kid on our hands. On the next card, both players yelled “LINKEE!” simultaneously, and the judges couldn’t decide who was first, so that card was discarded. The next point scored would determine the winner of the entire tournament. Our Question Master delivered the next four trivia questions, and Gordon shouted “LINKEE!” and answered that “Italian names ending with i” was the link. There was a gasp from the crowd! Had he pulled off the comeback of the century? That card was ignored, and a new one selected. For now, the finals would continue. But not for long, as Nikki would secure the game-winning point with one final cry of “LINKEE!”, earning her sixth and final point. At the 38 minute mark, the finals were over, and a new champion was crowned. #TeamNikki had triumphed! 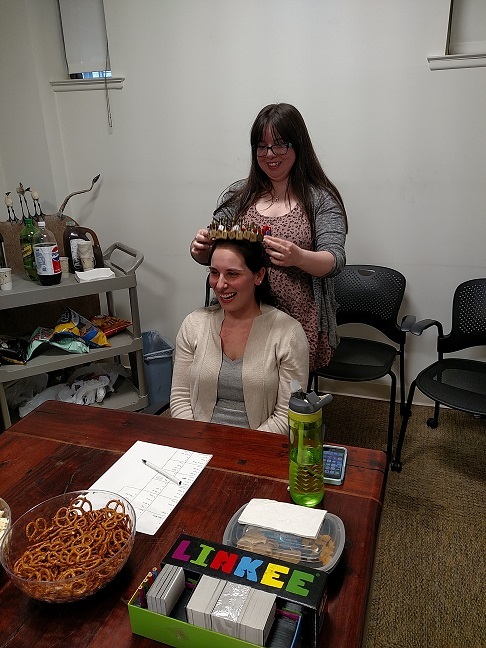 After congratulations were offered to both competitors for a worthy battle, Nikki was awarded not only her Game Night Prize Pack (consisting of popcorn, candy, and two games: Forbidden Island and Exquisite Beast), but the championship crown and scepter! She was even crowned by last year’s winner in a marvelous little passing-of-the-torch ceremony. We had a full spread of games available for visitors to enjoy, and regular readers of the blog would no doubt recognize several of the games on display, including Tak, Qwirkle, Tsuro, and Fluxx. And, as it turns out, Nikki wasn’t quite finished with her winning ways, as she proved victorious in every round of Loonacy she played after the finals. 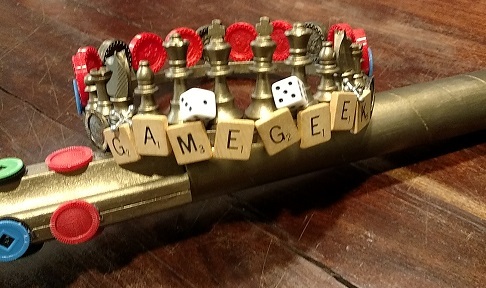 All in all, it was a marvelously successful day to cap off an incredible tournament, full of spirited competition, tabletop fun, and puzzly displays of skill. 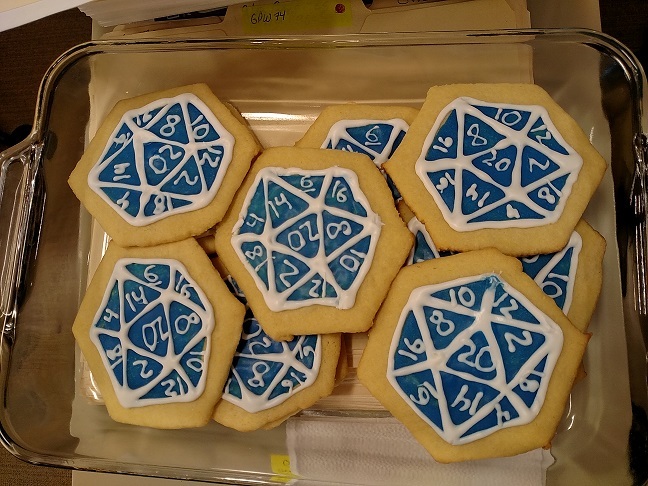 Sure, we celebrated International Tabletop Day a few days early, but we did it in style. Time is of the essence, so we’re doing a special Sunday post! 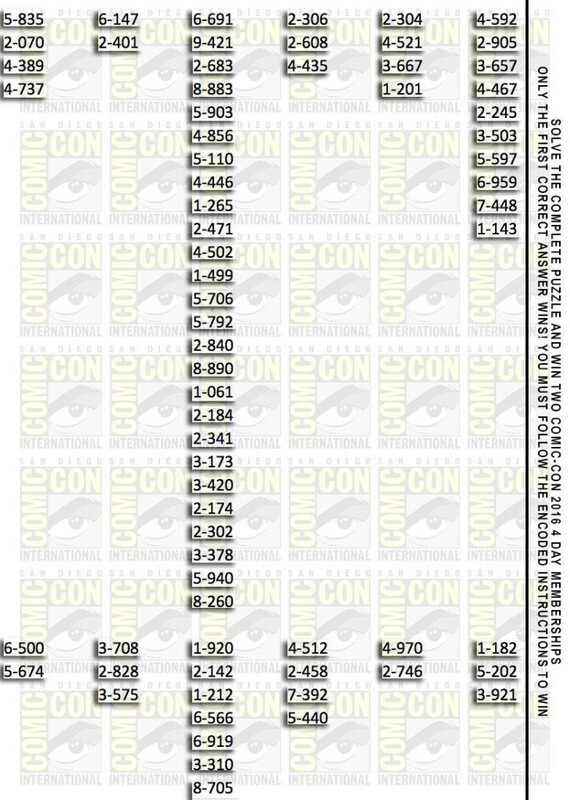 The biggest film, TV, comics, and geek culture convention in the world is undoubtedly San Diego Comic-Con, and as you’d expect, tickets can be pretty hard to come by. 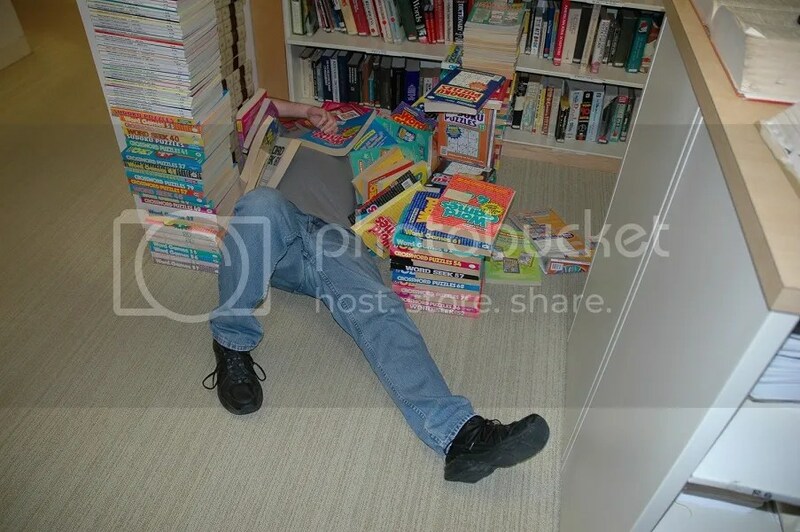 But guess what, puzzle fans and PuzzleNationers! Two 2016 San Diego Comic-Con 4-day passes are up for grabs, and only puzzly types have a chance to win them! It’s certainly a challenge, but I have absolute faith in the PuzzleNation audience’s solving skills. Once you have it figured out, you’ll know what to do next. Everything you need to know is in the puzzle. The first person to follow the instructions encoded in the correct answer will win the badges and be the envy of their friends. So get to work on cracking that code and we hope to see you in San Diego. In case you miss out on these tickets, make sure you check out their Facebook page in case any other puzzles drop out of the sky. Good luck, fellow puzzlers and PuzzleNationers! Well, it turns out I was late to the game with this post. It’s already been solved. Pretty impressive solving right there. Congrats to whoever cracked it first! It’s Follow-Up Friday: TableTop Day Eve edition! And today, I’d like to return to the subject of puzzly holidays! 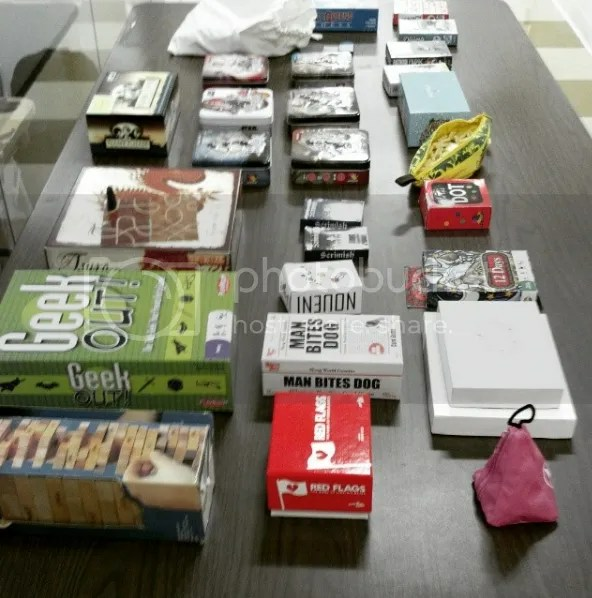 Saturday, April 30, is the fourth annual International TableTop Day, a day that has been set aside for family and friends to get together and play games. 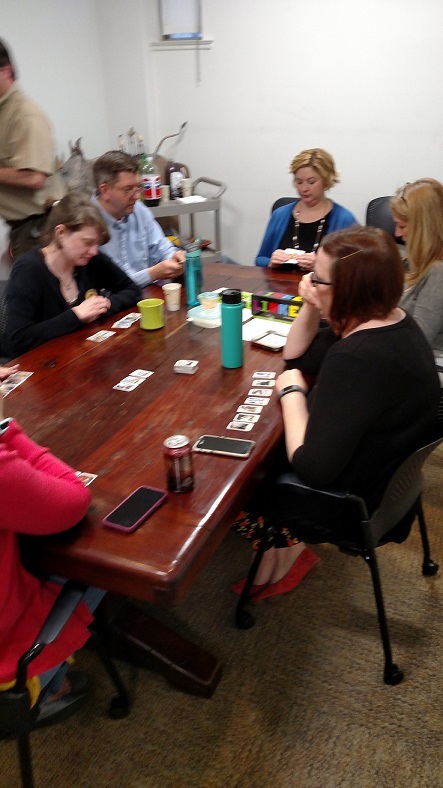 Board games, card games, role-playing games, puzzles…anything that involves gathering in person and having fun around a table fits the bill! 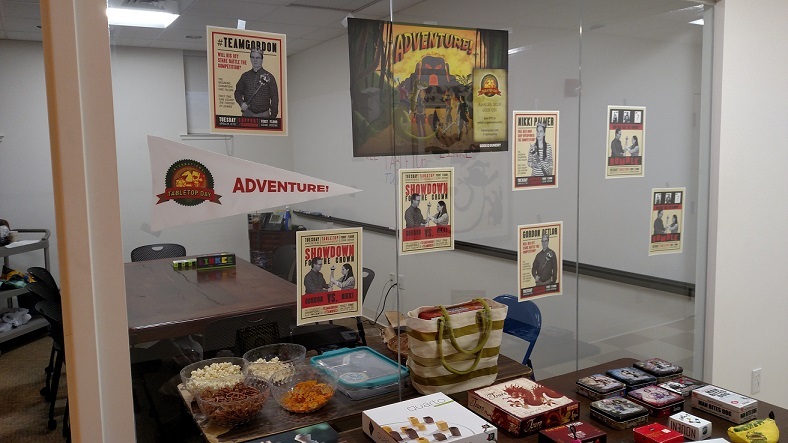 Although the actual holiday is tomorrow — making today TableTop Day Eve — we celebrated early! 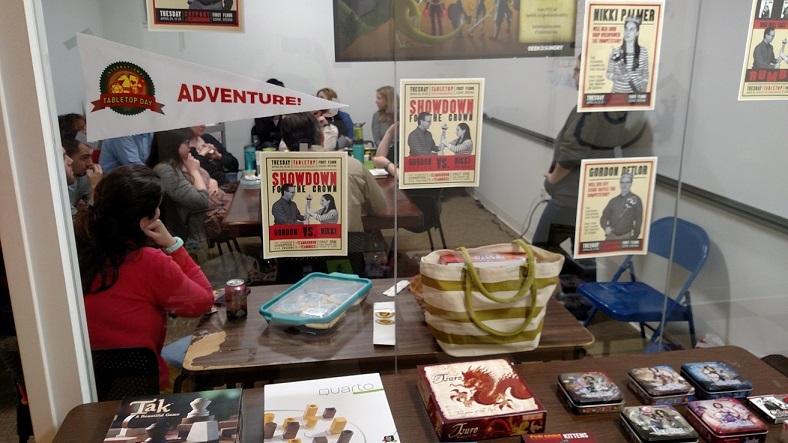 The PuzzleNation Crew got together with our friends from Penny Dell Puzzles for a few hours of TableTop Day fun on Tuesday! 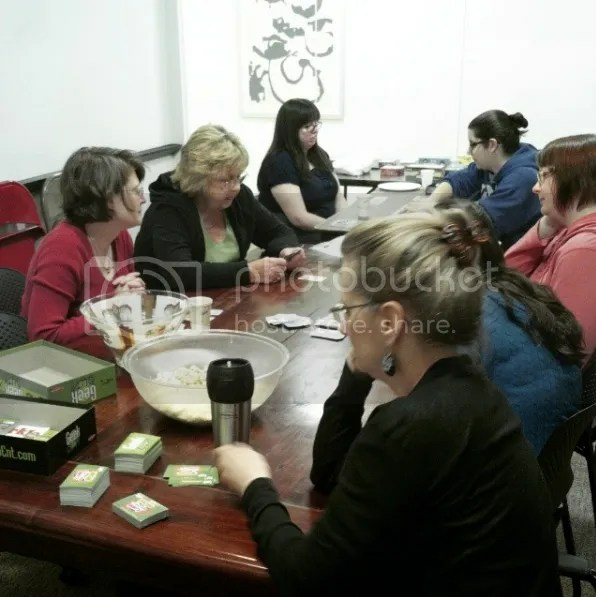 Games were played, snacks were consumed, and fellow puzzlers and PuzzleNationers were introduced to some terrific games. 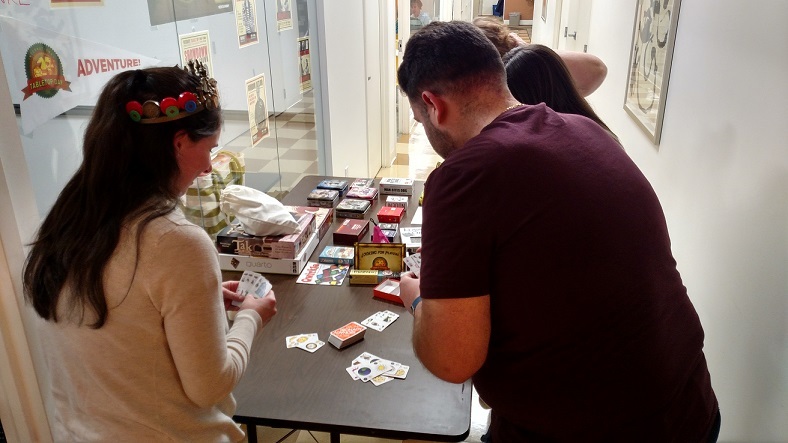 As usual, the event started with people picking out their favorites and introducing new players to the game. This was the case with Just Desserts (a card game all about serving desserts to hungry customers; guaranteed to make you hungry) and Timeline (a card game about history where you don’t need to know what year things happened, just if they happened before or after other important moments). One attendee opted to tackle the challenge of Puzzometry (a diabolical jigsaw puzzle) while I played a few rounds of Geek Out! and tested the pop culture and trivia knowledge of my fellow puzzlers. I started recommending some new games to the players at this point, and the hit of the day was easily Red Flags, a Cards Against Humanity-style game all about building the perfect dates for other players. The uproarious laughter inspired by the game was constant background noise while I explained the ever-changing rules of Fluxx to some curious players. 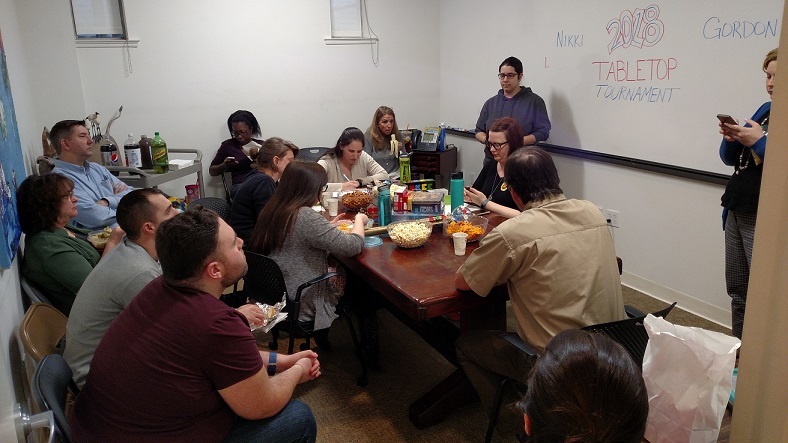 The day was a total success, and it was a wonderful break in the middle of the day, allowing for a fun way to interact and recharge before returning to a thoroughly puzzly workday. But that wasn’t all! To include fellow puzzlers who couldn’t attend the event in person, we had our own in-house session of Schmovie running all day. I gave participants five What? cards (Undercover, Magical, Teenage, Flying, The Last) and five Who? cards (Barista, Chef, Princess, Pro Wrestler, Spy) to combine as they saw fit, and then challenged them to come up with the funniest Schmovie titles for those subjects. Are you celebrating TableTop Day? Let us know your plans in the comments! We’d love to hear about it, see photos, and share in the fun!